Hurry up!!! 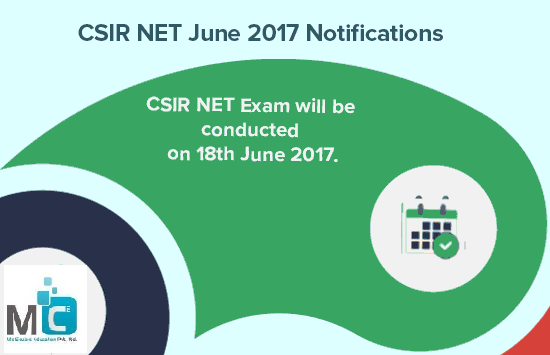 Today is the last date for submitting the application form for CSIR NET exam. The test is conducted twice in a year in June and December. So you have a great chance to give an exam. CSIR NET exam is for junior research fellowship and eligibility for lectureship. Our mc2academy arrange a crash course for CSIR NET June 2017 exam near to your place at Shivaji Nagar, Pune. Subjects included in this CSIR NET online exam in Pune are Physical science, Mathematical science, Life science, Chemical science, and Atmospheric, Earth, Ocean and Planetary science. The upper age limit is 28 years. The fee structures for this exam are 1000/-for general category candidates, 500/- for OBC-NCL category candidates, 250/- for SC/ST/Physically handicapped or visually handicapped candidates. The test will be conducted on five subjects. The paper pattern is like multiple choice questions of total 200 marks and divided into three parts. Part A: It contains all the common questions of logical reasoning, numerical ability, graphical analysis, and general aptitude. Part B: It includes multiple-choice questions with the various topics of the concerned subjects. For subjects of engineering sciences, it includes aptitude and mathematics questions. Part C: It this part, it checks candidate’s knowledge of scientific concept and/or its concepts. For subjects of engineering science, it includes subject related multiple choice question. There is a negative marking which is depending upon subjects. Our mc2academy provides you the best expertise staff. In this crash course, it includes theory classes, theory notes, test series, problem-solving, and doubt solving sessions. In this course, The whole syllabus will cover in the time & in a sequential manner. Mc2academy other branches are available in Mumbai, Aurangabad, Nasik, Satara, Kolhapur, Solapur, Jalgoan, Ahmednagar, Amravati, and Nagpur. for regestration CSIR NET Coaching in Pune contact us.